Marriage of Maud Knudsen and Herbert Garstin, 1892. On the evening of the 5th of this December, in the Episcopalian Church [St. Andrew’s Cathedral] at Honolulu, joined in marriage by the Rev. A. Mackintosh were Mr. Herbert Garstin and Miss Maud Knudsen, the daughter of Mr. and Mrs. Valdemar Knudsen of Kauai. The Alii, the Queen graced this marriage gathering, accompanied by the Governor and the Chamberlain, and a lady-in-waiting. On the next steamship to California, the couple will return to California, the place they wish to make their home, where they will spend their future days. 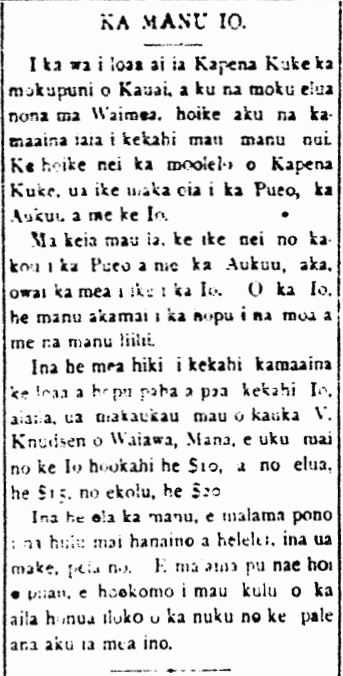 Ka Nupepa Kuokoa, Buke XXXI, Helu 50, Aoao 3. Dekemaba 10, 1892. The dwindling numbers of the Hawaiian hawk, 1889. When Captain Cook came upon the island of Kauai and his two ships docked in Waimea, the kamaaina showed him a number of large birds. Captain Cook’s journals say that he saw a Pueo, an Aukuu, and an Io. These days, we see indeed the Owl [Pueo] and Heron [Aukuu], but who sees the Hawk [Io]? The Io is skilled at snatching chickens and small birds. If some kamaaina is able to find and catch an Io, V. Knudsen of Waiawa, Mana, is always prepared to pay $10 for it; and for a pair, $15; and for three, $20. If the bird is live, be careful with the feathers and do not harm them and have them fall off; and so too if it is dead. Also be careful lest it rots, and put a few drops of kerosene in its beak to ward off rotting. 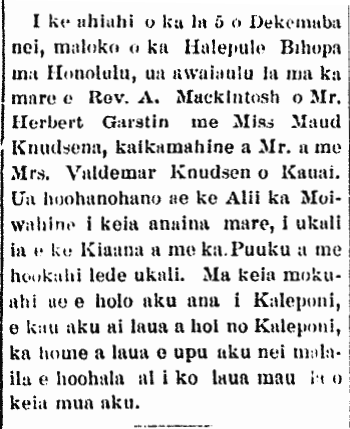 Ka Nupepa Kuokoa, Buke XXVIII, Helu 12, Aoao 3. Maraki 30, 1889.